Lendful Financial operates an online marketplace consumer lending platform for Canadian consumers. Lendful began operations in early-2015, and has since expanded across most Canadian provinces with offices in Vancouver, Calgary, Montreal, and Toronto. Their platform leverages technology to bypass borrowing through cumbersome processes at traditional banks, and instead allows consumers to apply for a personal loan in two minutes and receive funding within 24-hours. Lendful was acquired by Vancouver-based People’s Trust Company, a CDIC insured trust company, in June 2018. Alex Benjamin: CEO, Co-Founder (2015 – Present). Previously: Senior Investment Advisor, Mutual Trust Pty (Australia) (2012-2014), Investment Advisor, Macquarie Group (2003-2012). Education: B.Com., in Economics and Marketing from Deakin University (2003). Mitch Salis: COO & CRO (2016 – Present). Previously: Investor/Advisor, HoneyBee Financial Wellness (2016 - Present), CFO, Thinking Capital (2009 – 2015). Education: MBA in Finance from McGill University (1999), CFA. In early 2015, Lendful Financial’s Alex Benjamin noticed the following trends: (1) a large $82B Canadian credit debt level continued to grow, (2) loan delinquencies were at the lowest rates since the beginning of the global financial crisis, (3) spreads between deposit rates and credit card interest rates were at an all-time high, and (4) borrowing was not consumer-friendly when done through large Canadian banks. To capitalize on these trends, Benjamin launched Lendful on April 13th, 2015. Lendful looks to dramatically increase the response time for Canadian borrowers to receive loans, and to connect borrowers directly with lenders through an online marketplace. Lendful Financial received seed funding from Vancouver-based Stanley Park Ventures, and Ferst Capital Partners of Montreal. In early 2016, Lendful received $15M in backing from Alterna Bank. At the time of Alterna’s investment, this was one of the largest investments into an online lender by a Canadian financial institution. In June 2018, Peoples Trust Company acquired Lendful for an undisclosed amount. The Peoples Group of Companies offers a variety of financial services products to Canadians, and Lendful will contribute to their product portfolio. Lendful aims to simplify the application process for borrowers, and offers them a one-stop online solution where they can apply within minutes, and receive funds within 24 hours. Lendful utilizes technology to aid this process, allowing them to significantly streamline the borrowing process when compared to traditional financial institutions. Lendful operates as a marketplace technology platform, and acts as a liaison between originators and borrowers. Borrowers fill out an online application at lendful.ca, risk is algorithmically assessed, qualified applicants begin to receive offers from originators, then borrowers commit to a loan and receive funds. Lendful earns revenue through charging borrowers an origination fee and through servicing loans. 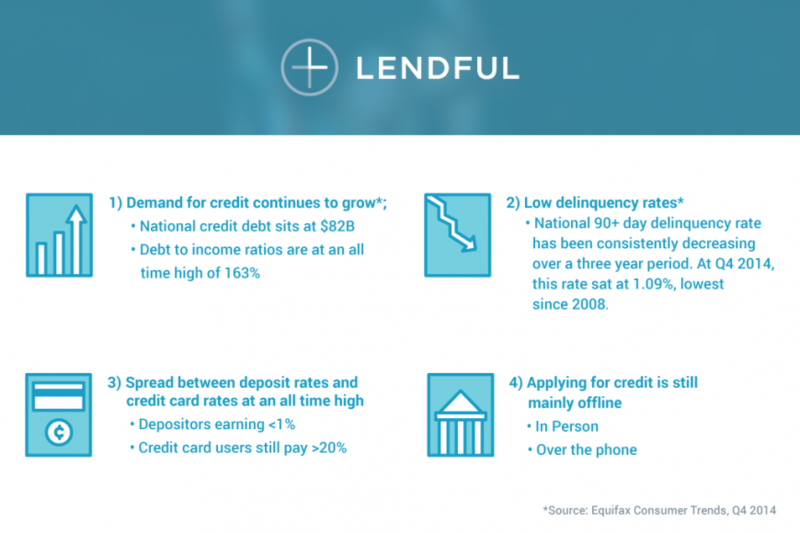 Lendful offers consumers loans ranging between $5,000 and $35,000 on fixed 3-year and 5-year terms. Customers are charged based off an “annual percentage rate” which includes both the loan’s interest rate and Lendful’s origination fee. Borrower’s interest rates are priced dynamically based on an automated assessment of risk levels (the less qualified credit, the higher the interest rate), and annual rates begin at 9.9%. Lendful utilizes technology to streamline the traditional process of borrowing through a financial institution. Consumers apply for a loan online through lendful.ca, and an automated process assesses the amount of risk on each file. This technology not only utilizes traditional methods of determining consumer risk, but also takes alternative data into consideration. Interest rates will be determined through looking at a consumer’s employment, loan servicing history, and credit score. Additionally, the technology can utilize data from Facebook (help to determine identity and lifestyle), LinkedIn (verifies employment history and estimates income brackets), and Vouch (peer-based recommendations and screening). Lendful services the Canadian personal-credit market through their website, lendful.ca. This multi-sided platform connects loan originators with borrowers. After committing to a loan, Lendful automatically withdraws interest payments and origination fees from the borrower’s bank account on a fixed schedule. Lendful partners with established Canadian financial institutions, such as Peoples Trust and Alterna Bank, to offer financial products. Additionally, they market their loan products through social media channels (LinkedIn, Twitter, Facebook). Borrowell – (Toronto, ON) Borrowell provides an online platform for unsecured loans of up to $35,000. They also offer automated credit reports and online tools to compare credit cards and mortgage providers. Grow – (Vancouver, BC) Grow was founded in 2014 and offers several white label financial technology products for enterprises. One of these products is a lending platform which allows institutions to quickly process loan applications.